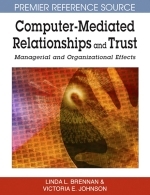 The purpose of this chapter is to examine ways to help build trust in virtual environments. More business and decision-making is being accomplished using virtual teams. These people seldom meet face-to-face but they work together toward common goals. A crucial factor in determining the success or failure of virtual teams is trust. Successful techniques for promoting and building an atmosphere of trust within virtual teams and maintaining that trust are a primary focus of the chapter. Learning organizations are discussed as a vehicle for promoting attentive listening, sharing information, mutual scholarship, and meeting expectations through innovation and networking.